✅WELL DESIGNED:The benefit of this design over other brands on the market is that there is no carabiner hook that can hit the camera body and cause damage. Weight is distributed evenly around your body meaning no more painful shoulders. ✅SUITABLE FOR: for Canon EOS 7D 20D 30D 40D 50D 60D 350D 400D 450D 500D 550D 600D 650D 1000D 1100D 5D Mark II 5D Mark III Digital SLR Camera;for Canon Powershot SX40 HS Digital Camera;for Canon Digital Rebel T4i T3i T3 T2i XT Xti XS Xsi T1i Digital SLR Camera;for Nikon D40 D40X D60 D80 D90 D300 D300s D700 D3000 D5000 D3100 D5000 D5100 D7000 Digital SLR Camera etc. 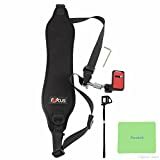 ✅Strap includes the Unit Strap which attaches to the strap lug of the camera and then to the Carry Speed Camera Strap for an extra measure of security if desired. ✅The strap is designed to fit across the shoulder relieving neck strain and allowing the camera to comfortably rest next to the hip. Strap length is adjustable for most body sizes and adjustable stops are included to assure that the camera will be where the photographer wants it, whether in the resting or taking position. Focus F2 is a multifunctional belt specially designed for photographers who go on a long journey, which can be used combinedly with several straps according to personal different need. It is made from nylon and mesh fabric with compactness and fitness, comfort and breathability, it can reduce stress and possess freeweight capability. It is equipped with multiloop shackle and dead plate that can adjust camera device optionally and shackle can be fastened on the front of the chest tightly. Several small straps can be adjusted optionally from beginning to end. It is convenient to carry to take camera bag and key ring equipped with free small loop, which you can combine shackle to fasten on the strap. The dead plate on the waist can be used together with belt and also can be used as a quick-release plate independently. Its multifunction makes it become a necessary product when travelling. •Unique product that combine style and functionality. •Strap is MOD compatible, High quality product to compatible with mostSLR cameras. •Lightweight and allow you to draw up your SLR Camera quickly. •There is one piece of tripod connection plate that accepts 1/4″standard screw. •Comfortable to use. It adopts ergonomic design, and weight isdistributed evenly by way of shoulder pad. •The strap is made of nylon. This entry was posted in Discount Photography and tagged Belt, Black, Cameras, Canon, Capacity10kg, DSLR, Focus, Load, Neck, Nikon, Plate, Quick, Rapid, Release, Screw, Shoulder, Sling, Sony, Standard, Strap by Ball Photo. Bookmark the permalink.